We have all heard about the Nuremberg war crime trials after World War II. We know much less about the war crimes trials of Japanese military personnel. Thousands of Japanese were prosecuted for war crimes and, until recently, little has been written about Australia’s conduct of 294 trials of 949 suspects between November 1946 and April 1951 in various Asian and Pacific locations, including Darwin, Singapore, Hong Kong, Papua New Guinea, and Manus Island. 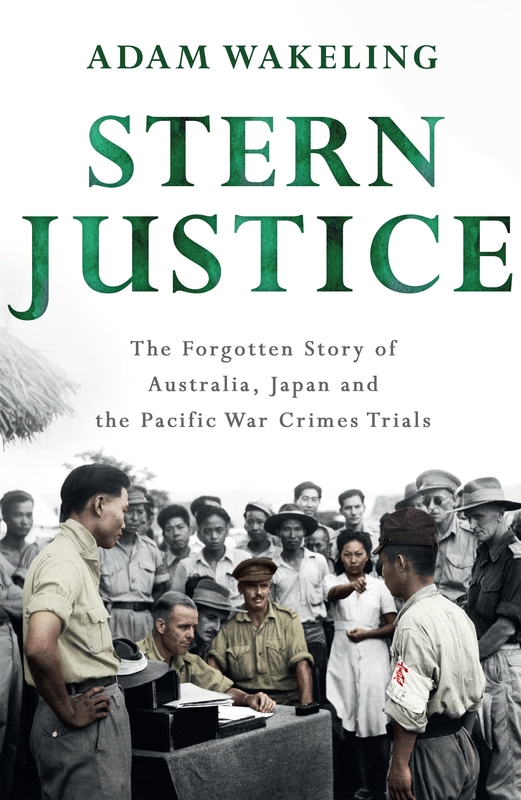 Wakeling’s book on the trials follows another recent work, Japanese War Criminals: The Politics of Justice after the Second World War, by Australian authors Sandra Wilson, Robert Cribb, Beatrice Trefalt, and Dean Aszkielowicz, which won the 2017 New South Wales Premier’s History Prize in the General History category. That work argues that the most important issues arose outside the courtrooms, in the legal basis for identifying and detaining subjects, deciding who should be prosecuted, the collection of evidence, and granting clemency after conviction. Stern Justice explores similar issues, its stated aim being to ‘bring back to the attention of the public Australia’s program of war crimes trials and to revive the debates that accompanied them’. It also raises the questions whether the victors had the moral right to put the enemy on trial (given the Allies’ bombing of Japanese cities and innocent civilians), whether the trials were conducted fairly, and whether the trials were about justice or about revenge? The title of the book reflects words in the Potsdam Declaration of 26 July 1945: ‘Stern justice shall be meted out to all war criminals, including those who have visited cruelties upon our prisoners’. This begs the question: meted out to whom? The book canvasses the issue of where responsibility lay for the crimes: on those who were obedient to orders to carry out atrocities or on those who gave the orders? How high up should command responsibility have rested? Should Japan’s Emperor Hirohito have been accountable for the war crimes of the Japanese government and military? Emperor Hirohito held the power to declare war and to end it. Should his inaction to prevent atrocities as the holder of ultimate war powers have been the subject of investigation for potential prosecution? Wakeling details Australia’s leading role in the push to include Hirohito on the list for potential prosecution. Dr HV Evatt, Minister for External Affairs, directed that the Emperor should be included on the list of those to be investigated and Evatt’s Department prepared a list of 64 names. It was my father, Dr JW Burton, who, in October 1945, as Acting Secretary of the Department of External Affairs, tendered the list for endorsement by Justice William Webb, whom Evatt had appointed to investigate Japanese war crimes and report to the United Nations War Crimes Commission (UNWCC). Webb had a reservation about including the Emperor’s name. According to a leading expert on the Australian trials, David Sissons, Webb said, in a teleprint of 24 October 1945, that Hirohito’s case should be ‘decided at the highest political and diplomatic levels’. Burton rejected this; he was aware of Evatt’s committed stand on the issue. He had been with Evatt in San Francisco attending the United Nations Charter Conference when, on 26 May 1945, Evatt cabled the then Acting Minister in Canberra, warning, ‘Nothing should be said in Australia to indicate any weakening of our policy of bringing Japanese criminals to justice irrespective of their office or eminence of their position’. My father’s teleprinter response to Webb on 25 October acknowledged that bringing to trial of any person on the list would require inter-governmental decision at a high level, but, he stated, this was not necessary for listing by the UNWCC of any person for further investigation, and keeping the Emperor on the list was in keeping with declared Australian Government policy. He despatched the list the following day for UNWCC consideration, with Hirohito’s name appearing at the top. Australia’s endeavour failed. In December 1945, Webb was appointed Australia’s representative on the newly established International Military Tribunal for the Far East. He declined to approve the inclusion of the Emporer on the list. In any event, General Douglas MacArthur had decided that the Emperor was not to be prosecuted. 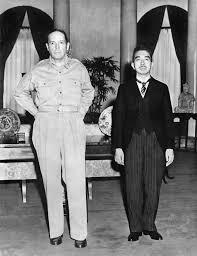 In 1946, Macarthur appointed Webb as the President of the opening Tokyo trial of Japan’s wartime political and military leaders. Webb subsequently conducted hundreds of other trials in the Asia-Pacific region. Wakeling raises an issue of procedural fairness concerning Webb’s dual roles – first in charge of investigations of war criminals to be tried, and then presiding at trials. Should Webb have accepted this judicial position? Wakeling examines other breaks away from accepted British courts martial processes and procedures as conducted by Australia. A controversial modification was to relax the rules of evidence, so as to allow hearsay evidence (something someone heard someone else say), and to admit documents into evidence although the author of them was not available to be cross-examined by the defendant. Courts martial are not required to give reasons for their verdicts and sentences. The choice of whether a sentence of death was to be carried out by hanging or shooting was sometimes influenced by whether there were gallows at the location, or enough men on hand for a firing squad. Labor under Chifley passed the War Crimes Act 1945 at a time when the ALP was moving against the death penalty. However, Wakeling explains, the mood of the Australian community was overwhelmingly to permit execution of war criminals, and the legislation permitted courts martial to impose the death penalty. To avoid political flak, the responsibility of Cabinet to confirm or commute the decision was shifted to the Commander-in-chief of the army. Turning to another important matter, Wakeling says in his Prologue that the first people to be executed by the Australian Army were Japanese convicted prisoners on the island of Morotai in March 1946. Australian soldiers were subject to the death penalty for mutiny and desertion but, Wakeling states, every death sentence handed down by Australian courts martial in both world wars had been commuted to a term of imprisonment. Is that correct? A Google search reveals reports of rumours that ‘diggers slaughtered German prisoners’ in New Guinea during World War I and, rumours aside, 2017 research by Kirstie Close-Barry and Victoria Stead confirmed that at least 21 (and possibly as many as 60) native New Guineans were hanged at Higaturu by Australians in July and September 1943. Drawing again on my own family history records, I know that my grandfather, the Reverend Dr JW Burton, then General Secretary to the Methodist Overseas Mission, wrote to Prime Minister Curtin on 20 April 1945 about his concern for 40 to 60 native New Guineans who were under sentence of death by the Australian military for treason. In his letter urging that the sentences be investigated by a competent anthropologist before being carried out, he referred to 28 natives who the Australian army had previously executed by hanging at Buna for ‘treason and murder’, despite recommendations for mercy by a Judge ‘who had considerable knowledge of native life’. Further evidence for this can be found at pages 129-130 of JV Barry: A Life (2007) by Mark Finnane with the assistance of John Myrtle. On the same day that my grandfather wrote, Barry KC wrote to Acting Minister for the Army, Eddie Ward, about the same concern. Barry stated that around 50 natives were about to be executed in Aitape for crimes arising out of war conditions and he recalled that ‘about 28 natives’ had been executed earlier in the war, as authorised by General Edmund Herring, commander of Kokoda forces. Barry wrote a follow-up letter to Ward a week later, after hearing that some of the Aitape executions had proceeded. My factual query aside, Stern Justice is an informative, easy to read historical work. The book looks at the changing Australian political and social attitudes of the day and examines public response to and criticism of the trials and sentences. It covers the aftermath of reconciliation and rehabilitation. Finally, it is pertinent to note that the last of the Australian trials were held on Manus Island in 1951 and, according to Wakeling, it seems that the prisoners there were put to work and treated humanely. This is an irony, given the poor conditions today’s refugees and asylum seekers are receiving on Manus and Nauru – that is, according to the limited reporting available on the living conditions of these people. It is to be hoped we do not need to wait 70 years to find out more about this part of our history. * Pamela Burton is a Canberra lawyer and a member of the Honest History committee. She is the author of a biography of Justice Mary Gaudron, a study of the Waterlow killings, and a novel. She has reviewed a number of books for Honest History and written about her life as an independent scholar and about her father, Dr JW Burton (use our Search engine).